For several weeks now, I’ve heard the trilling of an Eastern Screech Owl, Megascops asio, in and around my back garden–either at dusk or in the wee hours before dawn. Last week, I saw two owls sitting together just after sundown in my Retama, Parkinsonia aculeata, tree. Until then, I’d only spotted one at any particular time. Early this morning, noticing an upset and noisy Blue Jay cawing into the owl nest box, I spied this sleepy and probably annoyed Screech, settled cozily in his/her box. It’s a nice neighborhood and I hope this couple raises their little family successfully, as has happened for most of the last 8 years. All the best to my new neighbors! 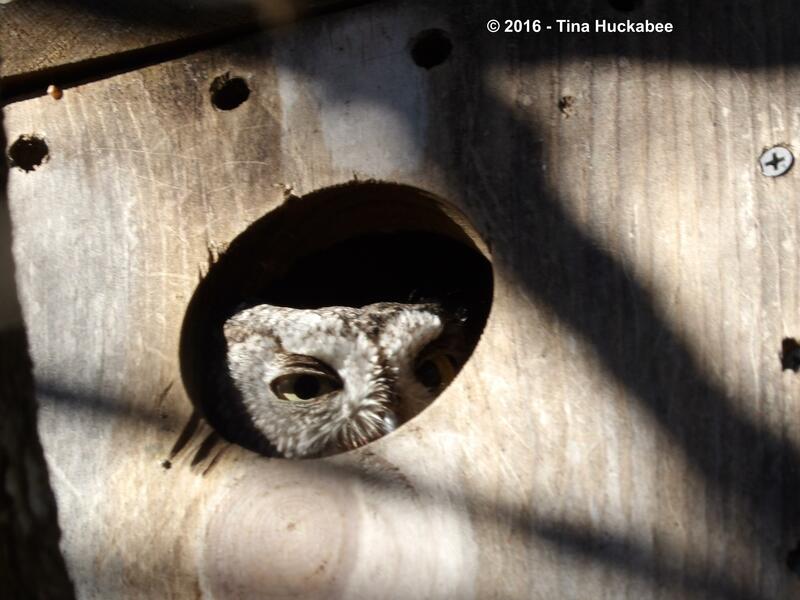 This entry was posted in Eastern Screech Owl, Megascops asio, Uncategorized and tagged Wildlife Gardening by Tina. Bookmark the permalink. Thank you, Frances, I was tickled to see her and get the photo. The Eastern Screech Owls have a very soft trill and, sometimes, whinnying sound that they make. I’m very attuned to it because I’m so fond of them, but no, they’re not loud or obnoxious. As for the Blue Jays…. Oh Tina, how absolutely wonderful, I am a little (well actually a lot) envious! We hear Owls here but not in our garden, I am ever hopeful though. Have you ever seen Owl babies? Ha! I hope she/he/they are successful in their procreation. Last year, the couple abandoned the eggs after a squirrel disturbed them. Sniff. So, fingers crossed that all goes well and they have lots of mice to eat! Yes, the owlets are absolutely darling! I’ve had to rescue a couple of them as they fledged from the box and weren’t yet good fliers. They’re very soft and just beautiful. They do have quite a set of talons though, so I’m very respectful of that! Tracy, it is really awesome!! What a great photo!. I put in 2 owl boxes two years ago, but have no owls.. My neighbor down the street has an owl in hers, which is probably why I don’t have one. But in one box there are bees and the other has a family of squirrels. Both are entertaining, so i won’t complain about not having the owls too much. Awe, that’s too bad but you’re probably right–the squirrels will move in if given half a chance and so will bees. Both are interesting though! I had jays yelling up a storm out back recently and only hoped it meant the presence of an owl. No such luck – our hecklers were driving out a jay that overstepped territorial or flock bounds some way. Once the designated intruder jay left, the rest of the gang just melted away. I think I need to hire you as the official title person–snort, “The Trill is Back”–so funny! I’m hoping for the best. I just came home and she’s be hanging out of the hole for most of the day. I hope she gets enough rest. Look at me, already fretting over whether “my” owls are okay. Sheesh. Oops, my bad: The author was William Service… not John. Eastern Screech Owls are charmers, that’s for sure. Shy and elusive, they’re fairly comfortable in urban settings. I haven’t read that book–I’ll check it out. Thanks! Congratulations! That will be fun to watch them over the summer. So cute! Plus, they’ll help you keep the rodent populations smaller. Screeches are darned cute. It’ll be interesting viewing for the next few months-hope they thrive. Such exciting news….I will miss Wildlife Wed next week, but have a post ready for the 10th…so I will still link in but late. Needing to take a break and won’t be posting until the 10th of March on my Living From Happiness blog…. It is exciting to have owls in the garden. No worries about WW next week–your posts are always welcome–whenever! Ooh, me too!! I’ll keep you apprised! How exciting! I hope you will keep us updated if you see more. That is very cool! I’m jealous! How high does the owl box need to be? If you build it, they will come. Well, they will if they’re common in your area, that is. The nest box is easy to make (Google plans-there are lots on the internet) and relatively easy to put up–if you don’t mind heights. The box should be 10-15 feet high; our is at about 12 feet. Our box is in a deciduous oak tree. In my neighborhood, there are at least a couple of Screech Owl pairs and at least one Great Horned Owl pair. Good luck if you decide to put one up and don’t be discouraged if you don’t get a nesting pair this year–there’s always next! I’m Tina’s husband and the crude carpenter who made this. This is the basic plans I used and it is quite simple. (If I can do it – so can most people): use one 1″x10″x8′ plank. Needs to be about 15″ high and not easily accessible. Our is probably a foot or two too low and it doesn’t seem to bother the owls. We’ve had owls every year and owlets (except for last year’s disaster) since we set it up about 7-8 years ago. Oh my goodness…. So exciting! We’re tickled about her choice of home! How exciting, and what a fabulous shot. Magical to have owls nesting in your garden. They are special, so elusive and shy, although this one is hanging out of her nest box hole quite a bit, just letting the neighbors know she’s here, I guess. Hooray! I’d love to have an owl in my garden. It might help if I put up an owl box…… Duh…..
Well, yeah, it does help to attract owls by having a nest box in the garden. Or, you could dig a wonky hole in one of your trees–that might do it. 🙂 I’d go with the owl house.